The SGPC today warned the ‘patit’ (apostate) Sikh singers with shorn hair or trimmed beards from reciting ‘Gurbani’. The SGPC has also imposed a ban on telecast of the recording of Gurbani recited by Patit Sikhs. The telecast of pictures of Sikh Gurus has also been banned. Noted Sikh intellectual and convener of Akhand Kirtani Jatha (prabandhki panchayan) Jathedar Joginder Singh Talwara today died at Guru Ram Dass Hospital here after brief illness. He was 70. He is survived by his two sons. Lieut-Gen Shamsher Singh Mehta, GOC-in-C, Western Command, today said areas near the Indo-Pak border in Rajasthan had been completely de-mined and the work of de-mining areas, falling near the Indo-Pak border in Punjab, was going on the war footing. The apprehension of a terrorist hand in the January 6 Goraya rail line blast has come true. The chemical examination of the damaged rail line parts by Forensic Experts has revealed that RDX was used to blow off the track. The Sadar Police today recorded the statements of four complainants in the human trafficking case which has been registered against pop star Daler Mehndi, his brother Shamsher and others one day after they had come from Gurdaspur to give evidence in the case. District and Sessions Judge A.N. Jindal put off the application filed by ousted PPSC Chairman Ravinderpal Singh Sidhu, seeking permission to file bail bonds in the disproportionate assets case, till tomorrow. The Judge ordered his record staff to present the file of the case to him by then. Punjab Chief Minister Amarinder Singh today urged Prime Minister Atal Bihari Vajpayee to allow him to invite Chief Minister of Pakistan’s Punjab as part of efforts to improve relations between the two countries. There is but one measure of success for this mere mortal — the immortality of his verse. Meeting Bashir Badr who is here to participate in an Indo-Pak mushaira, is an experience to savour. He seems to breathe and live the ghazal, his first and last love in life. And he does seem to be on the brink of achieving what he had been dreaming about since decades. 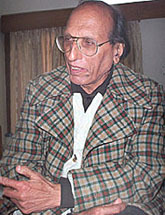 Bashir Badr in Patiala to participate in an Indo-Pak mushaira. The Shiromani Akali Dal (Amritsar) Kisan Wing today urged the Congress party high command and Punjab Chief Minister Capt Amarinder Singh not to induct legislators Amrik Singh Dhillon and Raj Khurana in the forthcoming cabinet expansion in the state claiming both the leaders were involved in a multi-crore fertiliser scam. Bimla Devi, a landless woman of Kathera village, was camping in the open, braving cold while guarding a piece of shamlat (village common land) she had forcibly possessed a few days ago. When this correspondent visited the village today, many other women like Bimla were sitting in the open, guarding the pieces of land they had themselves demarcated with bamboos and wires. At an impressive investiture ceremony held here today, one Yudh Seva Medal, one Bar to Sena Medal, 24 Sena Medals (gallantry), four Sena Medals (distinguished) and three Seva Medals were presented to armymen. Out of these 33 medals, five were given posthumously. The Goc-in-C, Western Command, Lieut-Gen S.S. Mehta, gave away the medals. In an alleged case of embezzlement of funds worth lakhs of rupees by a former Sarpanch, panchayat members of Saidpura village have demanded that inquiry in the case should be expedited. Mystery continues to shroud the death of a Mohali resident. Even after nine years, the Central Bureau of Investigation (CBI) has allegedly failed to complete the probe in the matter. The general-body meeting of the Municipal Corporation today held that the corporation was governed by Punjab Government bylaws, in force since 1957, on the issue of building of nursing homes and hospitals in this area and that these laws were applicable to Prem Nursing Home which had been built in a residential area in Punjabi Bagh locality of the city. The construction of a park by the municipal corporation at Dussehra ground at Bassi Pathana town of the district has become a bone of contention between Councilors and the administration. Two farmers were buried alive while trying to extricate a tubewell fan from a well here last evening, the police said. Mrs Praneet Kaur, M P, Patiala, will lay the foundation stone of a students' centre at Government College, Dera Bassi, on January 28. The M P will be the chief guest at ‘‘Nostalgia 2004’’, an annual function to be celebrated by the Old Students Association on the day. If allegations in a writ petition filed before the Punjab and Haryana High Court are to be believed, then a Station House Officer is demanding Rs 10,000 from a weightlifter for removing his name and photograph from a notice board in a Patiala police station. The Punjab State Human Rights Commission is planning to become the first State Rights Commission to go online. The Commission is giving final touches to launch its own website to enable a complainant to check the status of his complaint at a click of the mouse. Besides, the website will also provide all other relevant information related to the PSHRC. The pro-farmer measures announced by the NDA government on Tuesday are clearly aimed at garnering votes. The sitting up of a national commission for farmers was promised by Prime Minister Atal Bihari Vajpayee on August 15 last. It seems the government was waiting for an opportune time to make a formal announcement. The moderate to heavy rainfall received in various parts of this region will prove extremely beneficial for various Rabi crops such as wheat, barley, pulses and mustard. In a bid to bring about more transparency in its working and to ensure a greater decentralisation of powers, the Punjab Vigilance Bureau is all set to have three new zones, including one at Jalandhar. A man comes to a jewellery shop in the city. Tells the owner that a senior government official wants to see samples of jewellery for his daughter’s marriage. Takes the owner to the District Administrative Complex in a car, along with samples of jewellery. He tells the owner to wait in the car and disappears. Three persons were injured in a clash among relatives following a dispute here yesterday. Mr Jodh Singh and Mr Gurpreet Singh sustained head injuries and were admitted to the Civil Hospital. Ms Sukhjeet Kaur had an injury on her forehead. The Punjab Technical University, in its bid to ensure more employability avenues for students, has decided to start 13 new courses in different streams, including bio-technology and pharmaceutics under its Distance Education Programme.